Winter is here with all its beauty. It may not be that pleasant for our east coast friends who has to face the 6-inch tall snow walls right now. But here in San Diego we are having better time with slight colder breeze of winds and nice sunny afternoon. 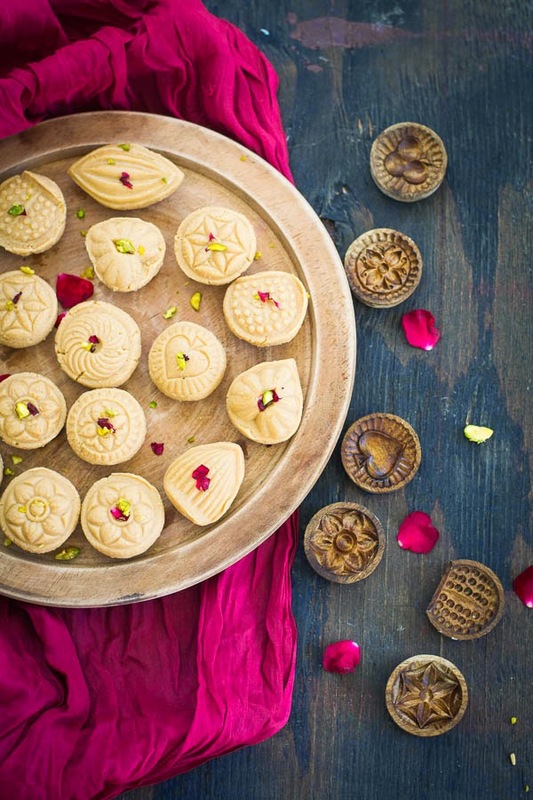 In our native land, winter is synonymous with some of its signature food and sweets. 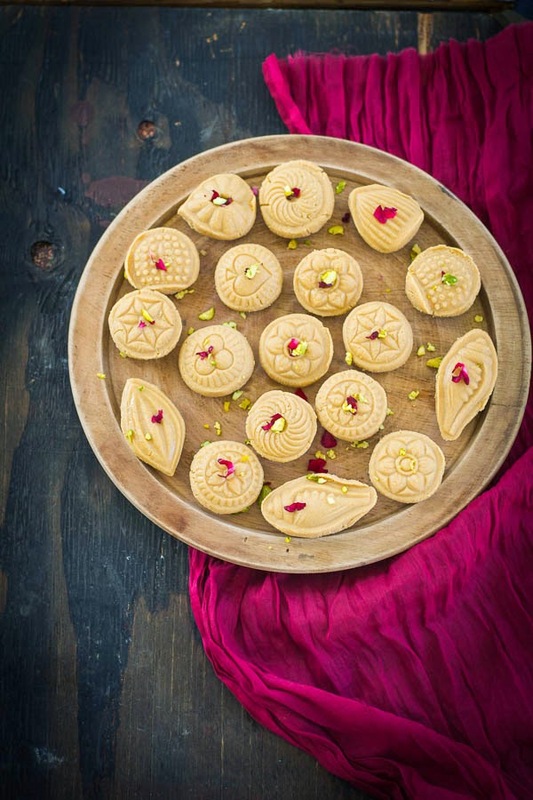 One of them is “Nolen Gur”-r Sandesh. 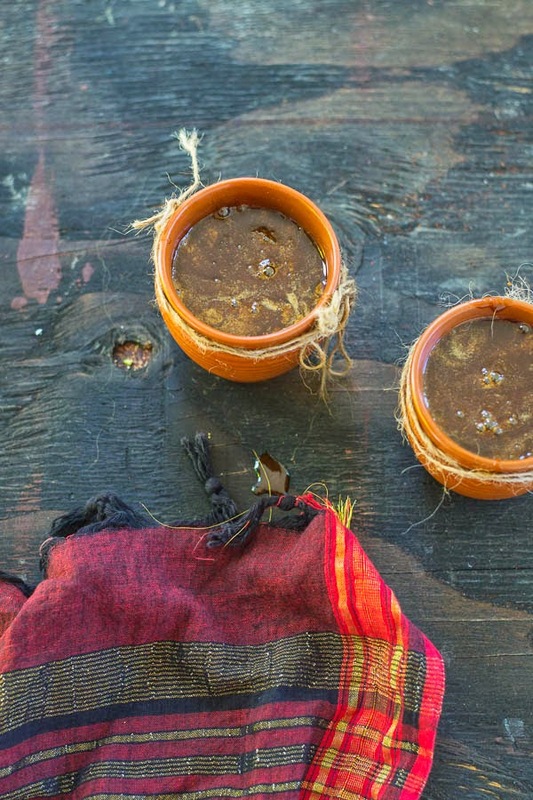 Nolen gur or date palm jaggery - a key ingredient in most winter delicacies from sandesh to payesh and everything in between. 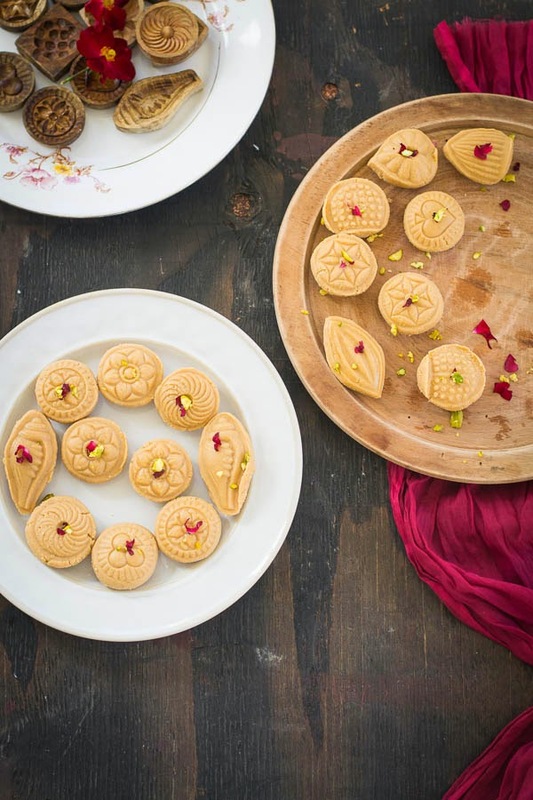 Today I will share the mouthwatering recipe of Nolen Gurer Sandesh. This is one more sweet that any Bengali can die for. The season starts immediately after Diwali or Kali Puja. Since we were in India this time during the festival season, we were lucky to get some good quality Nolen gur. Though it’s available nowadays throughout the year, it definitely tastes better during winters because of its freshness. Restaurants and sweet shops preserve nolen gur in its solidified form or as “patali gur” at freezing temperature and then serve it during other seasons of the year. 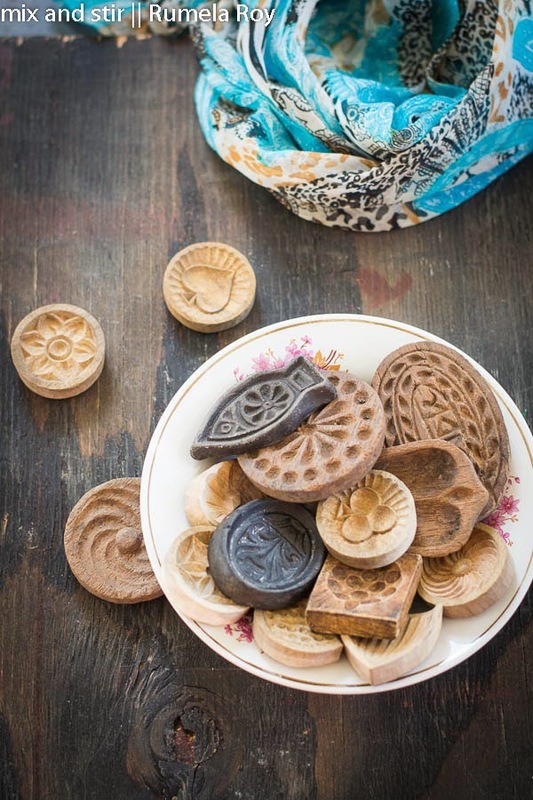 In my recent trip, I also got some beautiful molds for making Sandesh. Some of you already asked me about where you can find these molds in Kolkata. They are available in Natun Bazar near Girish Park, Kolkata. Since now I have the “gur” in my refrigerator and the molds to make the shape, then what to wait for ? I made the Sandesh that my readers were waiting for long time. I learnt making Sandesh in traditional way couple of years ago. Though the process is little time consuming but not so complicated. Also off late, I learnt about an alternative process of making Gurer Sandesh that uses Ricotta Cheese. It’s hard to believe that both the versions taste alike. Using ricotta cheese in the place of home-made Indian Cottage Cheese (i.e. Chenna ) means the process is more simplified and it cuts the cooking time by half. So in the same post I will share both the methods. Try out whatever is convenient to you and pamper your soul! 1. Boil the milk in a heavy-bottomed pan over medium to low heat, stir occasionally. Once the milk starts boiling, lower the flame. Pour the lime juice and stir in. Milk will start cuddling and change into chenna ( cottage cheese ) and greenish water. 2. Remove the pan from heat and leave the chenna in this condition for 3 to 5 minutes. 3. Pour the chenna - water mixture over a cheese cloth or a soft cotton cloth and let the water drain away. 4. Put this cloth with the chenna under cold running water for 2 to 3 minutes to remove the lemony smell. Then hang the chenna along with cloth on the kitchen faucet for around 45 minutes. 5. Now once again squeeze the cloth, if there is any extra water. But note that the chenna should not get too dry. 6. Put the lump of chenna over flat surface and knead it. Start kneading with the heal of your palm for about 4 to 5 minutes. Add Nolen Gur ( Date Palm Jaggery ) and knead again until jaggery is totally mixed with the chenna. 7. Put a nonstick pan on low heat, add the kneaded chenna. Cook the chenna at low heat by stirring it continuously with a spatula for about 4 to 5 minutes. 8. Brush the inside of the molds with little ghee ( clarified butter ).Take out the warm Sandesh and shape with molds. If you don't have any molds just toss into balls. Serve warm or at room temperature. (Part Skim)Ricotta Cheese : 32 Oz. 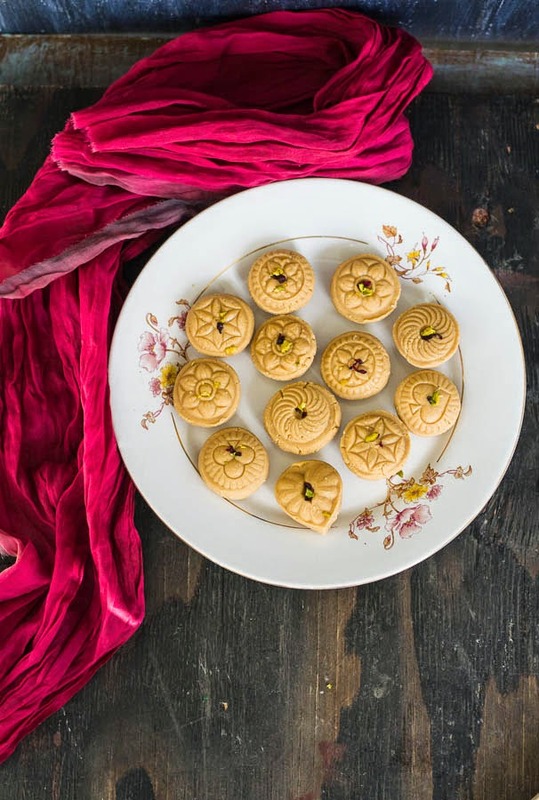 Nolen Gur ( Date Palm Jaggery ) : around 12 tablespoons if it is liquid 'gur' or If you are using 'patali gur', take little less than one ball or as per the desired sweetness. Ghee (Clarified butter) : 2 tablespoons. 1. Take a mixing bowl, add the ricotta cheese and the jagerry and mix it well. If you are using Patali Gur. Cook it in the microwave for few seconds. The jagerry will be soft. Mix it nicely until jaggery is totally mixed with the cheese. 2. Take a nonstick pan and add the cheese jaggery mixture. Cook it at low heat by stirring it occasionally. It will take time, once mixture comes out clean from the side of the pan that means you are done. Don't make it too dry, because when it comes to room temperature automatically it will become tight. So avoid cooking for extra time. Otherwise it will turn out KodaPak r Sandesh. 3. Take it out from the pan and let it cool down. You can put it into the refrigerator for half an hour. Now warm up the ghee, add 1 tablespoon of it to the Sandesh and knead it nicely. 4. Brush the inside of the molds with little ghee ( clarified butter ) and shape with molds. If you don't have any molds just toss into balls. Serve warm or at room temperature.